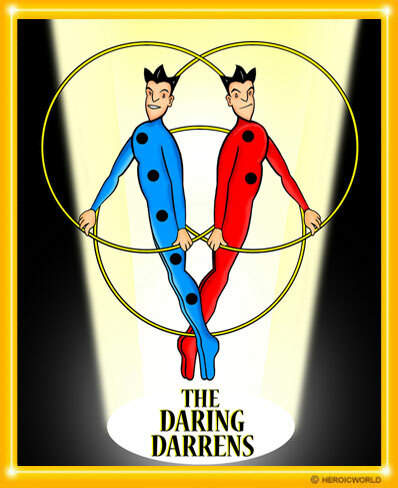 Visit the Daring Darrens on Facebook! Powers: Heightened Juggling ability has increased all his senses and agility. The Darrens' competitive spirit constantly challenges each to out do his brother. Weaknesses: Juggling together for so long, Flip and Dash work in perfect unison. They don't work as well alone. The Daring Darrens Once arm wrestled for seven hours with no winner. 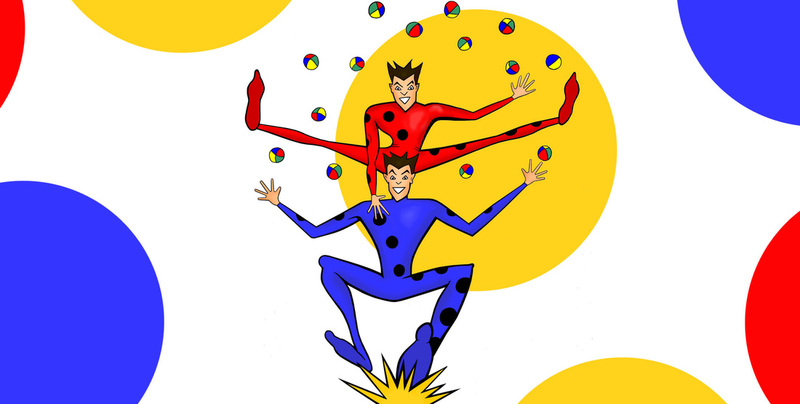 The Daring Darrens got their start on the Eddie Juggle's show. Flip has never done "The Seven Chainsaw Swirl" with eight chain saws. Dash once considered becoming a race car driver. Juggling has made the Daring Darrens rich. Harry likes making money. That's why he fought harder than any agent in the biz when it came to the Daring Darrens. You can bet that he asks a pretty penny when it comes to Flip and Dash. ​Harry is not just in it for the money he is also a fan. Harry has done so well with The Daring Darren's that he has dropped all his other clients. Now he spends all his time promoting the boys, they've built quite a kinship. Eddie Juggles worked his way up, juggling in some of the seediest dives you'd never want to be seen in. He eventually created a juggling empire becoming the most famous juggler in the world. If he wasnt on such an insane ego trip he never would have allowed the Daring Darrens his show. The crowd loved the Daring Darrens, and soon Eddie became old news. ​He let his anger toward the Daring Darrens destroy him and now swears revenge, not only on them, but the audience that betrayed him. The Daring Darrens avoid politics whenever possible but that doesn't stop Senator Feinberg from trying to catch the hunky duo. ​She is the Daring Darrens Biggest fan and books them at every political event she can. She will pay whatever price, to pin them down and has often risked her political reputation to satisfy her infatuation with the world's greatest jugglers. Billy Bob Banister always thought he was destined for life on the farm. That was until he saw the Eddie Juggles Show. Billy Bob started with eggs. Soon he was juggling tractor wheels. At a local fair Billy Bob was spotted by Sid Winchill who promised him a juggling career. When Billy Bob saw the Daring Darrens steal the spotlight from his hero Eddie, he became determined to use his juggling talent to squash the Daring Darrens.